Tired of feeling like the RV version of a greenhorn every time you go to a campground? Wish you had a better grasp on camper terms, acronyms and the general slang the rest of the campers know and use? This list is a good starting point to acquaint you with the more commonly used words, phrases and abbreviations. If you want more, RV Education 101 has a library of RV books and ebooks as well as online training and videos. 15/20/30/50a — A campground that has electricity for RVs needing 15, 20, 30 and 50 amp service. Anode Rod — A rod used in a steel water heater to attract corrosion-causing products in the water. Anode rods should not be installed in an aluminum tank. Basement — The large storage area underneath the floor of the RV, accessible from outside storage doors. Usually refers to storage in a Class A, Class C or 5th Wheel. Basement Model — An RV that incorporates large storage areas underneath a raised chassis. Black Water — Waste (sewage) from the toilet that is flushed into a black water holding tank, usually located beneath the main floor of the RV. Blueboy/Blue-boy — Term for plastic portable waste handling tank, often in a bright shade of blue. Boondocking — Camping in an RV without benefit of electricity, fresh water, and sewer utilities. Also called dispersed camping, primitive camping or dry camping. Bumper-Pull — Slang term regarding the hitch or towing method for a conventional travel trailer or popup. Bureau of Land Management (BLM) — The Bureau of Land Management manages 245 million acres of public land in 12 western states, many with free or low-cost dry camping, dump stations, and off-road recreation opportunities. Class A Motorhome — The largest and most expensive RV ranging from 24 to 40 feet long and includes converted busses and purpose-built models. It is powered by either a diesel or gasoline engine. Class B Motorhome — Also called a camper van or camping van conversion, it’s typically built on a standard full-sized van chassis, with a raised roof to provide additional headroom. Models usually range from 16 to 21 feet. It is powered by either a diesel or gasoline engine. Class C Motorhome — Also called a “mini-motorhome” or “mini,” a midsized RVs ranging from 16 to 33 feet built on top of an existing truck and van chassis. A Class C motorhome has many of the same advantages and considerations as the class A, but at a lower overall cost. Dinghy — A vehicle towed behind a motorhome, sometimes with two wheels on a special trailer called a tow dolly, but often with all four wheels on the ground. Doughnut/Sewer Doughnut — Rubber ring that seals an RV’s dump hose to the campsite sewer hookup so gases and odors don’t escape. Doughnut seals are required at most campsites and hookup locations. Dump Station — The area, usually a concrete pad with an inlet opening connected to an underground sewage system, used for dumping of black and gray water tanks. Fifth-Wheel Trailer (Fiver or Fifth Wheel) — Trailers designed to be coupled to a special hitch that is mounted over the rear axle in the bed of a pickup truck or a specialized vehicle prepared for fifth-wheel trailer compatibility. The living space has over-cab sleeping, and comes with its own heating, air conditioning, propane supply, electrical systems and water tanks. Folding and Tent Trailers — Some of the smallest towable RVs available, with collapsible compartments made of hard composite walls or durable tent canvas that reduce their external profiles and makes them easy to store when not in use. Full-timers — People who live in their RV (towable or motorized) year-round. Gross Axle Weight Rating (GAWR) — The manufacturer’s rating for the maximum allowable weight (including the weight of tires, wheels, brakes and the axle itself) that an axle is designed to carry. GAWR applies to tow vehicle, trailer, fifth-wheel and motorhome axles. Gross Combination Weight Rating (GCWR) — The maximum allowable weight of the combination of tow vehicle and trailer/ fifth-wheel, or motorhome and dinghy: the weight of the vehicle, trailer/fifth-wheel (or dinghy), cargo, passengers and a full load of fluids (fresh water, propane, fuel, etc.). Gross Trailer Weight Rating (GTWR) — The maximum allowable weight of a trailer, fully loaded with cargo and fluids. Gross Vehicle Weight Rating (GVWR) — The total allowable weight of a vehicle, which includes the vehicle’s chassis, body, engine, fluids, fuel, accessories, passengers, cargo, etc. Holding Tanks — The fresh water, gray water, and black water tanks on the RV. The fresh water tank is for drinking, cooking and washing; the gray water tank holds wastewater from the sinks and shower; the black water tank holds sewage from the toilet. Honey Wagon — A mobile service that will empty the waste holding tanks on an RV at a campsite. Hula Skirt — A guard or skirt installed on the RV’s back bumper to protect the vehicles directly behind them from debris thrown up by the RV’s rear wheels. It’s usually the length of the rear bumper and resembles a “short” version of a Hawaiian hula-skirt, hence the term. Kingpin— A 2-or-3 1⁄2-inch-diameter (50.8 or 88.9 mm) vertical steel pin protruding from the bottom of the front of the semi-trailer that is part of a fifth-wheel coupling. Leveling Jack — A jack lowered from the underside of trailers and motor homes for the purpose of leveling the vehicle. 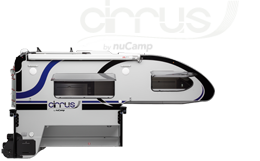 It’s designed to bear a significant portion of the RV’s weight, even lifting it off the ground on certain models. Long Term Visitor Area (LTVA) — A seasonal permit granted by the Bureau of Land Management for a maximum of 14-days stay on designated undeveloped public lands. Macerator — An electrical pump that allows the content of black and gray tanks to be emptied into a remote sewer connection. Moochdocking — Dry camping (boondocking) for free on someone’s property, such as a relative or friend. National Park Service (NPS) — National Park Service manages every national park, official U.S. monument and historic, cultural sites in all 50 states. Camping options range from dispersed camping with no facilities to full-hookups and other amenities. Also provides America the Beautiful Passes, a ticket to more than 2,000 federal recreation sites. Part-timers — People who use their RV for longer than the normal vacation time but less than one year. Pin Weight or Kingpin Weight — The weight from the trailer that is transferred to the kingpin. Pop-out — A room or area that “pops-out” for additional living space in RV. This type of expanded living area was more common before the technology of slide-out rooms became popular and available. Porpoising — The up and down pattern of motion experienced in an RV while on the road. Potable Water — Drinking water that is safe to drink or to use for food preparation. Primitive Camping — Also known as dry camping or boondocking, it is camping without the modern convenience of full-hookup facilities of city/well water, sewer/septic and electricity, relying on onboard systems for these conveniences. Pull-Through — A campground that allows an RV to enter from one side and leave from the other, eliminating the need to back up the RV into the camping site. Receiver — The part of the hitch into which the hitch bar is inserted. Reefer — A slang term for a refrigerator. RV refrigerators are usually either a two-way (gas and AC) or a three-way (gas, AC, and 12v DC) operating mode. Shore Power — A boating term adopted by the RV community referring to electricity provided to the RV via a shore cord from a fixed, external source other than the RV’s battery or portable generator. Slide-Out — The portion of an RV that slides outward (via hydraulics, electricity or manual operation) to provide more interior space when the RV is parked. Stabilizing Jack — A jack inserted under or lowered from trailers and motor homes for the purpose of stabilizing the vehicle. It’s not designed to bear a significant portion of the RV’s weight, but only a small amount to reduce movement during occupancy. Stabilizing jacks are generally found toward the back of trailers, under the king pin of fifth wheels, and under some slides. State Wildlife Areas (SWA) — Most State Wildlife Areas are strictly for wildlife preservation, management and hunting. Unlike the US National Wildlife Refuge system, camping is often prohibited. Sticks N Bricks – RV slang for a standard house. Stinky Slinky —A slang term for the sewer hose, constructed from a spiral wire covered with vinyl. One end attaches to the RV piping and the other into the local sewer dump facilities. 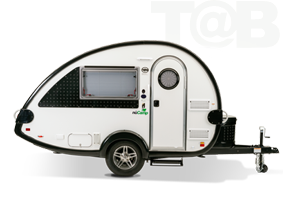 Teardrop Trailer or Teardrop Camper Trailer — A towable trailer with a “teardrop” profile. 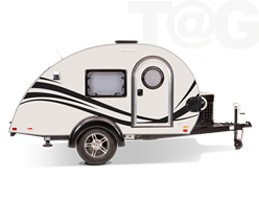 Size, amenities and specifications vary, as does the type of vehicle needed to tow the teardrop. Tongue Weight — this is the actual weight pressing down on the hitch ball located on the tow vehicle, which is generally 10% – 15% of the Gross Vehicle Weight (GVW). Tow Rating — The maximum weight your tow vehicle can safely tow, set by the vehicle manufacturer. 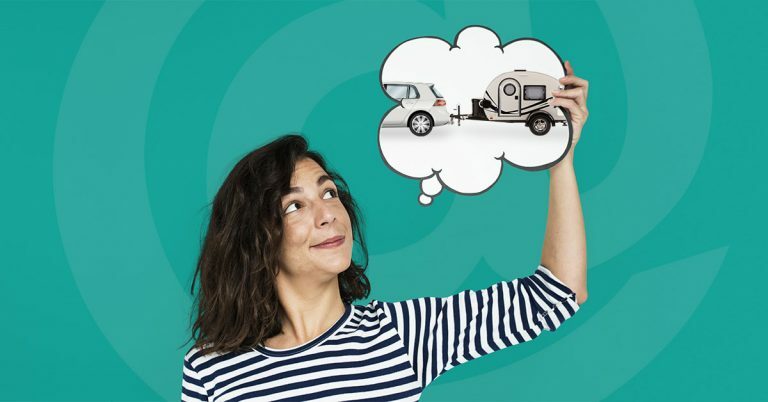 Towable RV or Travel Trailer— Small RVs (folding camping trailers, teardrop campers, truck campers, travel trailers and fifth-wheel travel trailers) designed to be towed by a motorized vehicle (car, van or pickup truck) and don’t require a special highway movement permit. They include HVAC system, electrical systems and water tanks and sleeping space, with some having bathrooms and kitchens. Toy Hauler or Sport Utility Trailer — The term for a fifth wheel, travel trailer or motorhome with built-in interior cargo space for small cars, dune buggies, four wheelers, motorcycles, etc. Features include a large rear door that opens down to create a ramp, a dedicated garage area or fold-away furniture to provide storage space, and often a third axle to support the heavy items. Truck Camper or TC — Also called a Slide-In, Slide-On or Cab-Over, it’s a camper that slides into the bed of a truck, then slides out onto its own legs at the campsite. Umbilical Cord — The wiring harness connecting the trailer to the tow vehicle during transport. The umbilical cord supplies the trailer with DC power for charging the batteries and operating DC equipment. It also operates the trailer brakes and signal lights. US Army Corps of Engineers (COE) — The Army COE manages recreation lands around projects like dams and bridges. Camping facilities are often sparkling clean with level parking aprons (after all, engineers designed them!). US National Wildlife Refuge System (NWR) — The agency that administer a national network of lands and waters for the conservation, management, and where appropriate, restoration of the fish, wildlife, and plant resources and their habitats within the United States for the benefit of present and future generations of Americans. W/E — A campsite that offer only water and electric hookups. Wildlife Management Area (WMA) — A Wildlife Management Areas (WMA) is a protected area set aside for the conservation of wildlife and for recreational activities involving wildlife. Policies vary by state. Workamper® or RV worker — An RVer who trades a little labor for a free campsite, salary or both. Workamping — An RVer who stays in an RV while working as an employee, operating a business, or donating time as a volunteer. Thanks to the following sources!